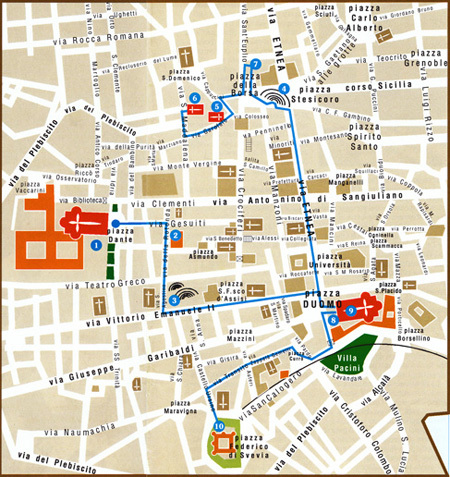 Our itinerary begins in Piazza Dante, home of the Benedictine Monastery (now University) and the Church of St. Nicholas, with a perfect tribute to our early settlers, the Greeks from Chalcis, who settled in 729 BC in the uppermost part of city built the center of religious life and politics: the Acropolis. In Piazza Dante can see the remains of one of the spa buildings (1) built in Roman times, also see the remains of the Via Rotonda ù Terme della Rotonda (2). The presence of such an abundant number of spa buildings is explained by the fact that the area was well served by the water dell'Amenano. We reach the Via Vittorio Emanuele and we stop to visit the beautiful Roman Theater and the adjacent Odeon (3). The Roman theater had a capacity of over 7,000 spectators and was also home to performances on the water. Cross Piazza Duomo and walk along the Via Etnea to Piazza Stesicoro (greek poet of the sixth century BC.) Where it offers to our eyes the spectacle of the Roman Amphitheater (4) elliptical in shape and made of lava stone and marble blocks, shown in light between 1904 and 1906 even though a large part is still buried beneath the streets of centro.Continuando cross our Sant'Agata In Jail (5) the place of martyrdom and death of the saint and La Vetere Sant'Agata (6 ). Going back to Via Etnea to Piazza Duomo: below the cathedral are the ruins of the Baths Achilleiane (8). The cathedral dedicated to Saint Agatha was placed in a position to control the port and the city walls and to this end with a 'high tower observatory function military. Note the splendid facade designed by Giovan Battista Vaccarini. Remember to Piazza Currò the remains of the Baths of the address. 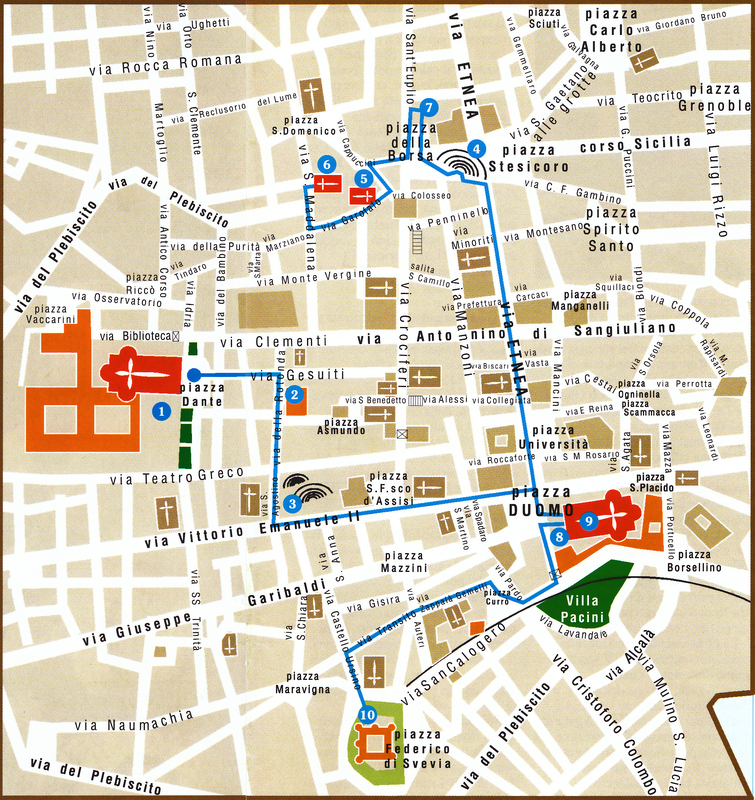 From Via Zappalà Gemini reach Piazza Frederick of Swabia where you will find the Ursino Castle (10). The Emperor Frederick II of Swabia in 1239 ordered the construction of the Castello Ursino but with the eruption of 1669 was surrounded by lava which filled the gap. To date, the castle houses the civic museum.